The above have home made markers. Initials only and no dates. This cemetery is located across the railroad tracks at Minnie on County Rt 36, about two miles turn left and go up the hill for about a mile. The Cemetery is fenced and well cared for. 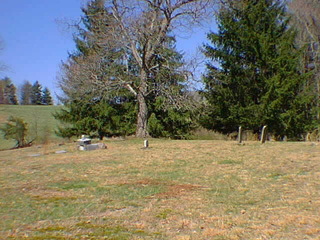 A short distance on up the hill is the Youst or Yost Family cemetery. They are on Hupp Run. 14. Raliegh or Rollan "Rolly" Fluharty s/o Jacob Fluharty Sr. and Frances (West) Fluharty b. 1843 d.
28. Porter Hodge b. 1876 d.
36. Jim Nice b. d.
37. Alice (Yost) Tennant b. d.
38. Infant Yost b. d.
39. Raymond Hall b. d.
40. Jerry Tennant b. d.
41. Olive Tennant w/o Jerry Tennant b. d.
42. Rellie Tennant b. d.
43. Blanche Tennant b. d.